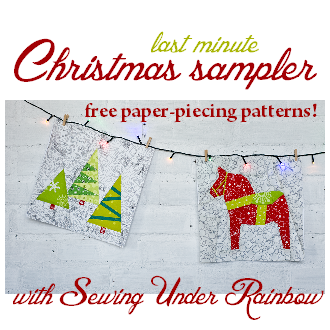 There are 12 super sweet Christmas themes paper piecing blocks free in this last minute quilt along. Reindeer, angels, snowflakes, trees & more to make some wonderful holiday decorations and hand made holiday themed gifts for friends and family. All the patterns are Craftsy downloads so they'll always be safe and sound in your Craftsy pattern.